At 2:50pm on a brisk afternoon in Boston, Massachusetts, a deafening bang and bright flash engulfed the sidewalk of Boylston street at the finish of the Boston Marathon. For ten eternal seconds, hundreds of people looked on in horror and disbelief until another bang and flash sprang from the ground one block down the street. For a generation of Americans haunted by the fall of two towers on a September morning a dozen years ago, on-lookers were most certainly met with the terrifying notion that they may be standing witness a similar tragedy. But like those in New York in 2001, witnesses to this tragedy overcame a momentary feeling of horror with courage and resilience as runners, policemen, firefighters and others ran towards the destruction searching for those in need. In the hours after the blasts, hundreds of stories of heroism were documented through photos and videos that are both heart-breaking and awe-inspiring. Runners who had just crossed the finish line continued running to the nearest blood bank to give blood. First-responders and witnesses with just basic emergency training ran towards the destruction to carry away victims, some of whom had lost their legs. Off-duty doctors rushed to their hospitals without being called in to see what they could do to help. Hearts broke across the nation as people turned on their TV’s and learned the news. People also took to social media like Twitter as a nation looked for answers and grieved collectively through a hashtag: #prayforBoston. #prayforBoston also quickly linked to the stories of the heroes as we all shared in the light and the love that drove out darkness and hate on that afternoon. Today, an interfaith memorial was held in Boston as those who were lost are or will be laid to rest. For those who grieve, today (a few days removed from tragedy) marks the beginning of a difficult path as most of life returns to normal but the absence of a loved one becomes a painful and ever-present state of mind. With recent tragedies in Tucson, Aurora, Newtown and now Boston, America is a nation whose collective faith has been tested in unprecedented ways. With advancements in media and technology, the experience of these tragedies is more personal than ever as graphic images and details are sent to our phones, computers and TV’s in real time by both professional journalists and bystanders with a cell phone. Despite this, America has grown tremendously in the face of terror since 2001. No act of cowardice can shake our resilience. No statement of hatred or evil can turn our eyes from the actions of unexpected heroes in our community. We have become a nation that has taken Dr. King’s message to heart in our darkest times. 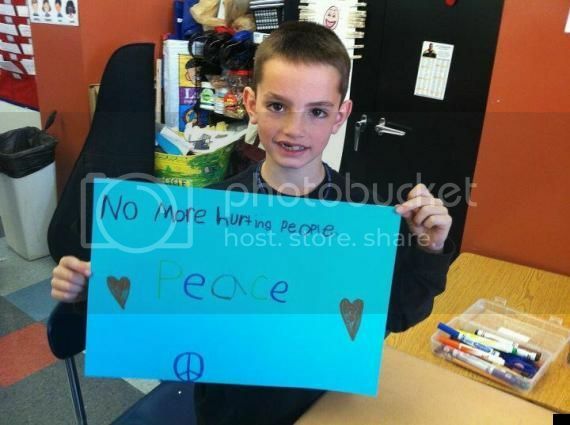 Martin Richard, who was killed in the Boston Bombing, made this poster in school and was aware of recent tragedies across the country. In the coming days, we will search for answers and for justice. We will not forget those heroes and we will continue to pray for those we lost and their families as well as the injured who begin a long road to recovery. In short, we will continue to #prayforBoston. Thank you and God Bless. In the first sporting event in Boston after the bombing, Bruins hockey fans gave a memorable rendition of the national anthem prior to the game.